Forrás: The Libya Observer. Szerző: AbdullahBenIbrahim. A bride in the eastern city of Bayda died of henna poisoning on Sunday, local sources reported. Bayda Media Center said Wafa Muftah Bu Farda applied henna laced with toxic agents on her hands and feet in preparation for her wedding party, which was expected to take place on February 28. The use of henna is part of Libyan women’s tradition, especially for brides. 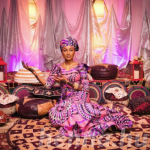 The parallel Libyan News Agency in the eastern region said the bride’s sister has been admitted to hospital suffering from multiple chemical sensitivity due to the use of toxic henna. Her health condition is said to be critical. The death toll of henna application in east Libya has risen to 59 since the registration of the first case in 2011. The town of Marj has hit the highest levels of toxic henna usage where 1022 cases and 44 deaths were recorded. Health officials in east Libya explained that the henna, which is widely sold in the market, contains high levels of a chemical dye so powerful and toxic called paraphenylenediamine (PPD), an ingredient that can cause chemical burns and lead to dangerous skin reactions. 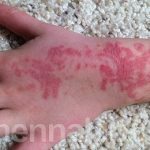 Arabian henna (black henna) is dangerous!